So I went for the 12 mile run this morning. The one I wanted to lie about and say I had to work. It wasn’t a “great” run–but it was not bad either. I ran in the sun, which I absolutely hate hate hate. I ran with a sore hip, which was fine till around mile 11. (“till around mile 11”. That makes me smile). My knee started to hurt but it didn’t stop me. And then, not before I knew it, I was finally at the END! I did not feel “invincible” like I thought I would. I felt peaceful. A better feeling than I could have asked for. One coach ran with me in the beginning. And another coach ran with me in the middle. And then I ran with me at the end. It was when I started running alone I thought “uh oh. It’s just me and me….”. But I was not bad to run with. And I could never say this before Team in Training. I used to be the WORST running partner to myself. My brain was always out to get me, and it would grab me by the neck and not let go. Until I was convinced of some doom and gloom that was about to happen or until I was filled with resentment over some thing that happened in the PAST, or until I was crying. That was what my mind used to do when we were out running together. Beat me up. However–this time…it was pretty quiet. And the most it said to me was “Where’s that Jack in the Box sign??”. (because that’s where the starting was). And that’s pretty much it!! When my knee started hurting–it was OK to let it be sore and stop to stretch it and continue on my way. When my hip started to act up, it was OK to put some pressure on it as I took a walk break. And even though the sun was beating down on me–my mind was not reminding me of it every 30 seconds. So the stretch that I ran solo was…..pretty quiet. And if I’ve never believed in miracles before today…I believe in them now. The fact that my mind allowed me to just BE is a total miracle. T O T A L. M I R A C L E.
I started my run happy and chatting with teammates. TNT provided 2 water stations, where I stopped and happily chatted for about 5 minutes. They offer water, m&ms, cheez-its, and some energy drinks/gu. And they offer an ear to hear all about how you’re doing up until that point. 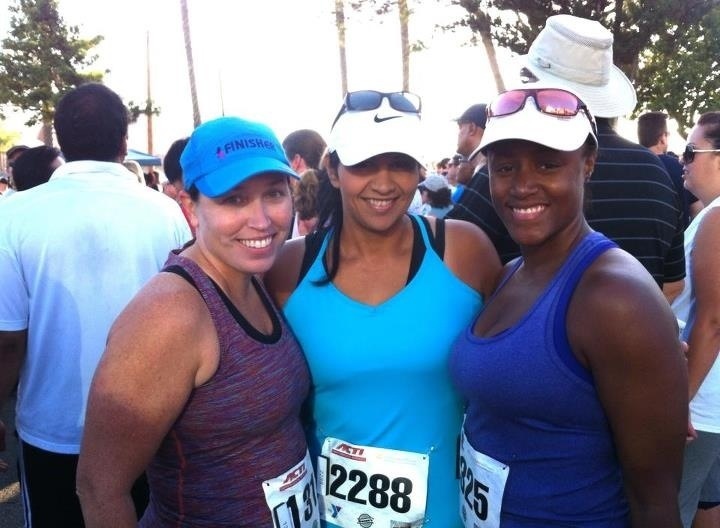 As I left the first water station I found myself running alongside two women who happened to be from TNT-Orange County. We ran together for maybe 10 minutes before we went our separate ways. This was something I could not do before, and not only could I not do it—I didn’t want to do it!!. My mind always held me prisoner and others were not allowed anywhere near me. But here I was, running with two women I’d never met before, and enjoying it. At the end of the run–those of us who get there first wait for the others. No one is left behind. Some teammates have plans and have to leave, and that’s fine. Some teammates have no plans (like me most of the time) and we wait till the last one comes in. 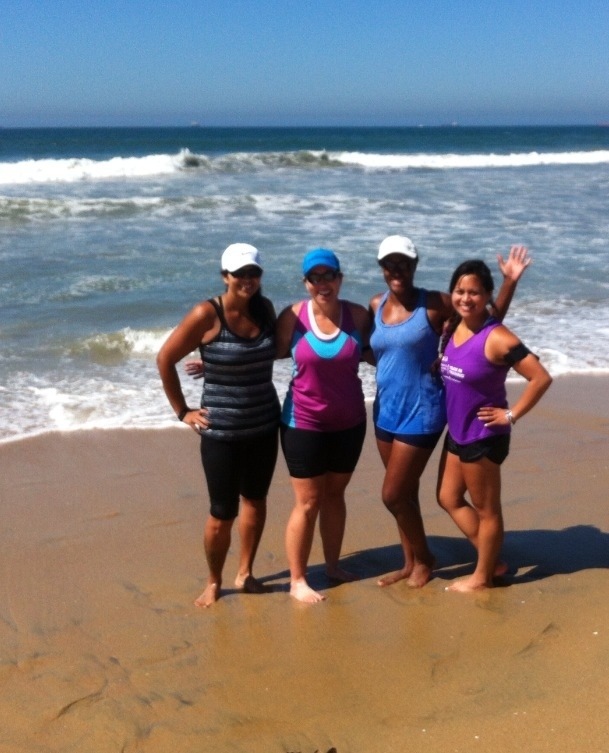 I ran 12 miles today, but there were a few teammates who ran 16 miles because they are training for a full marathon. And watching them come into the end is simply amazing. Yesterday my brother-in-law, who is fighting his own battle with cancer, told me he went to the grocery store and got tired halfway through grocery shopping and had to go out and sit in his truck and wait for his wife. Hearing the frustration in his voice was disheartening. I run. Because I can. Because I’m healthy. Because my legs work. Because I’m not on chemotherapy. Because I’m not sick with nausea. Because I have the energy. And with each single stomp on the pavement today— stomped out cancer cells in my brother-in-law’s body. That’s what I imagined anyway. Perhaps that’s why my mind cut me a break today. Because it is on the same page. A few of us soaking our feet in the nice cold water after stomping out cancer. As always…an uplifting read! You are AMAZING and I am so glad that you had the run you did today…you deserve the peace in your head and heart. Love you!